When we are children, our parents do everything in their power to teach us that our choices have consequences. As an adult, it is not likely that you haven’t experienced this concept a number of times and therefore, have become more conscious of the decisions you make and what the outcomes will be before you ever make them. This same concept exists heavily in the world of law. Known as foreseeability, knowing how someone should be held responsible for their actions is beyond important. This is especially true in legal cases that involve someone being held liable for any injuries that occur because of a negligent act on their part. If you are planning on filing a personal injury claim, there are many different conditions that have to be met in order for you to even stand the slightest chance of winning. The very first thing you must be able to prove is that someone breached their “duty of care” resulting in your injury. This could be something as basic as a person’s duty to act as a reasonable driver while behind the wheel. Whether this means that they were driving while intoxicated or simply were not following the rules of the road, you have to be able to prove it. Secondly, you must have suffered real harm from the incident. This could be anything from pain and suffering to the cost of your medical care. 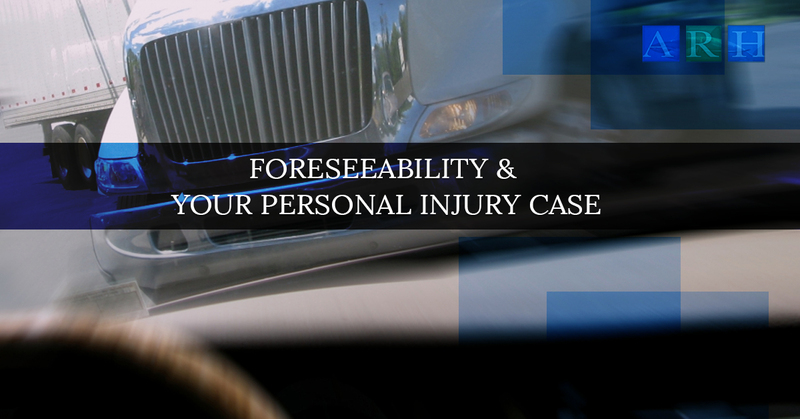 Foreseeability is an important aspect of this process as being able to prove that one person’s actions was the cause of the the other party’s injuries forms the foundation for any personal injury case. Without it, the responsible party may not be held liable. As a legal construct, foreseeability is a construct that is used to determine definitive proximate cause for the negligent act that led to the injury occurring. If you want to complete the foreseeability test, all you have to do is ask whether a person of ordinary intelligence could have predicted the general consequences that came from his/her conduct. For example, let’s think about a car accident that occurs because a driver was texting while they were operating their vehicle. In a case like this, could the person have known that using their cellphone while driving may result in an accident that could harm another person? Absolutely. In a case like this, the negligent driver would likely be held responsible. Conversely, if a driver is behind the wheel when they have a heart attack and their driving during this event causes an accident, it could be argued that the driver was not acting in a negligent manner. Seeing as how this hypothetical driver had absolutely no control over the vehicle at the time, nor did they have any way of preventing the event, this would not be considered a foreseeable event. However, if the driver had a history of heart attacks, it is likely that the event would be considered foreseeable. Alternatively, when it comes to what are considered Acts of God, such as earthquakes, tornadoes and more, these are all events that would be considered unforeseeable. The idea of foreseeability came from the case known as Palsgraf v. Long Island Railroad Company. This was a landmark case that took place in 1928 in the United States. The case was built on the basis of a man who rushed to board a train and in the process dropped a package that contained fireworks onto the tracks. While two railway workers rushed the man onto the train, the package hit the rails, causing it to explode which caused the scales on the side of the track to fall and hurt a bystander, Ms. Palsgraf. The railroad was then sued by the bystander as she claimed that the two workers who had rushed the man onto the train without allowing him to explain that the package was potentially harmful, had been negligent. While Ms. Palsgraf won the initial trial, the verdict was reversed after an appeal by the railroad as there was not enough evidence to prove that Palsgraf’s injuries were foreseeable to the railroad station, therefore making them not liable. Need A Lawyer To Help You With Your Personal Injury Claim? If you have been involved in a car accident that resulted in you sustaining injuries, it’s important that you seek out the help of attorney as soon as possible. Having someone on your side who can help you to prove that there was foreseeability in your case will aid you immensely in obtaining the settlement you deserve. Contact the Law Offices of Alex Hernandez Jr. today and allow us to set up an appointment for one of our attorneys to talk with you about your case. We look forward to helping you expose the truth and get exactly what you deserve.